Sep 28, 2018: The Reserve Bank has released data relating to India’s International Investment Position at end-June 2018. The data in excel file can be downloaded from RBI site. India’s quarterly IIP is disseminated with a one-quarter lag. The IIP for end- March 2018 was placed in the public domain on June 29, 2018.
o Net claims of non-residents on India declined by US$ 13.1 billion from their level at the end of the previous quarter. 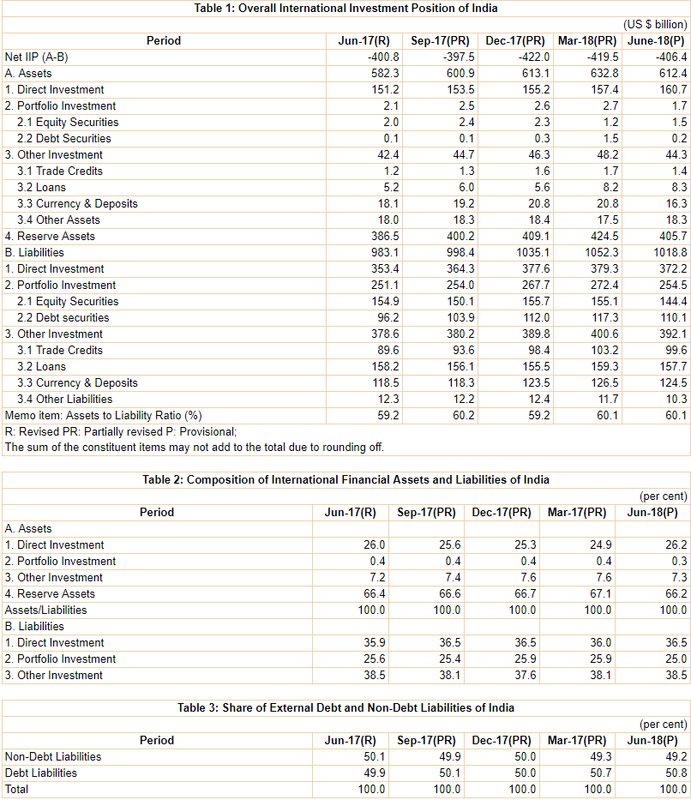 o Indian residents’ overseas financial assets as well as foreign owned assets in India declined during the quarter, with the decline in the latter being larger (Table 1). o Of the decline in Indian residents’ foreign assets, as much as 92.2 per cent occurred through reduction in reserve assets, which exceeded the increase in overseas direct during the quarter. o The decline in foreign-owned assets in India was broad-based across foreign direct investment, portfolio investment, trade credit, commercial loans as well as currency and deposits. o Large valuation effects associated with the depreciation of the Indian Rupee against the US dollar during the quarter impacted net claims of non-residents. o Reserve assets accounted for two-thirds of India’s international financial assets (Table 2); debt and non-debt liabilities had almost equal share in total liabilities (Table 3). o The ratio of India’s international financial assets to international financial liabilities stood at 60.1 per cent in June 2018 (59.2 per cent a year ago).